Zamerah MI Muasau,Tazanna EP Leilua Muasau; Brothers, Livingston Muasau, Viavia Muasau: Sisters, Sina Mauga, Katherine Leota, Rachel Ve’e, Stephanie Faletagaloa. 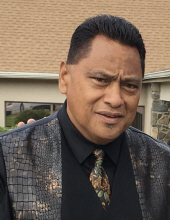 Visitation 9 a.m. on Sunday, April 7, 2019 at Nuuanu Memorial Park & Mortuary, service at 9:30 a.m. Visitation again on Monday, April 8, 2019 at 8:30 a.m. services at 9 a.m. Burial at 3 p.m. at Hawaiian Memorial Park. To send flowers or a remembrance gift to the family of Zachary S, Muasau, Reverend, please visit our Tribute Store. "Email Address" would like to share the life celebration of Zachary S, Muasau, Reverend. Click on the "link" to go to share a favorite memory or leave a condolence message for the family.